The countdown on ranking The Beatles studio albums continues- #13 was Yellow Submarine- #12-The Beatles For Sale, #11 Let It Be- now coming in at #10- With The Beatles. 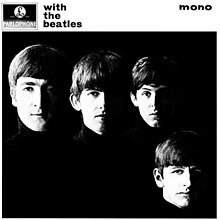 With The Beatles was the second album release from The Beatles- and the last album they released before exploding in America and around the rest of the world. It was released on the day of President Kennedy’s assassination- November 22, 1963. The album contains 14 songs- 8 Beatles originals and 6 covers. During their career The Beatles would change from album to album- I would the only exception would be the first two albums- Please Please Me and With The Beatles. Those two albums are very similar in style. I love both albums but if they had kept repeating themselves they would have been a two- three year wonder but we know they kept getting better- and The Beatles from 1965 would sound like a totally different group of musicians- and the songs would have very little in common. Keep in mind Please Please Me was released in March 1963 just eight months separate the albums. Please Please Me was incredibly recorded in one day- With The Beatles was recorded over seven sessions from July to October 1963. With The Beatles contains 14 songs that had never been previously released- no old singles or b-sides attached to it- when a Beatles fan in the United Kingdom bought this they were getting all fresh product. Of the six covers-three are exceptional- You’ve Really Got A Hold On Me- a cover of a Smokey Robinson written song. The Marvelette’s “Please Mister Postman”- The early Beatles were heavily influenced by the girl groups of the early 60’s- and the album closer Barrett Strong’s “Money” which had been the first hit Motown ever had. Til There Was You- sung by Paul was a very poor choice, Roll Over Beethoven sung by George is passable but Devil In Her Heart- also sung by George is below par. The originals- John’s “It Won’t Be Long” is one of the albums best tracks, All I’ve Got To Do- also sung by John is also exceptionally strong. The highlight for Paul on this album is probably the most played song from this album- All My Loving- the album starts off very strong. George’s first written song- Don’t Bother Me- well let’s say George would slowly improve his songwriting over the years to the point where at the end of The Beatles he could hold his own with John and Paul- but he was clearly the junior partner at this point. Little Child clocks in at 1:46- not bad but Hold Me Tight borders on being brutal-sung by Paul- a very poor performance- I’d go as far as to say his worst singing as a Beatle. I Wanna Be Your Man which was most famous for being given to The Rolling Stones in their very early days- is the Ringo song on this album. I’ve always liked it although it was a throwaway song. Not A Second Time is another very strong John Lennon effort- he would say later that he was trying to write a Smokey Robinson type song with this. The early Beatles were dominated by John Lennon- and the best songs here- other than All My Loving-which is Paul’s great moment- are John driven songs. The songs on this album are short- most in the 2-3 minutes range- the shortest 1:46 and the longest at 3:01. One of the reasons I like this album is -I never heard these songs that much on the radio back when I was younger and a radio head. These are not among the most famous of Beatles songs. Some would no doubt place Let It Be over this- it had 3 number ones on it but this although not viewed as a major Beatles album today- is a fun listen. I can feel the excitement here so I am placing it at #10. Again, kudos to you for doing what I would find impossible – ranking The Beatles albums. I think “Money” is one of their strongest covers, BTW. I always have Twist And Shout at the top of their covers list- but Money is right behind it. It Won’t Be Long is the one that hooked me when the album was played for me. That song started my Beatle journey. “All I want to do” and “Not A Second Time” I really liked also…I wish they would have picked a better cover than”Till There Was You.” I liked their version of Please Mister Postman…probably my favorite version of it period. I keep forgetting this album did not have “I Want To Hold Your Hand” or “I Saw Her Standing There” like it’s American counterpart. Again like later albums you add the singles of the period and the album would have been even stronger- whoever’s decision it was in a way- was ahead of the times- albums at that period of time were hit singles and filler. The Beatles didn’t include the singles and the songs on the album not filler- except a couple covers. They made an album a whole work…for a lack of a better phrase. This slot would have given me the most trouble between this and Please Please me. In thinking about it in my mind- the next grouping of three albums very difficult to separate. Not that it gets any easier after that..
I’m going to be curious where Magical Mystery Tour will fall. Good luck. I have a clear #6 — 7, 8 and 9 are hard to separate.. of course I have 1-5 but a case could be made for any of them I think. They are all favorites of many. With the Stones it would be a little easier with a few exceptions. I love the exuberance of the early Beatles. It’s obvious that Paul, in particular, is having so much fun. I like the reverence that they show their cover material. You Really Got a Hold on Me, Money, Roll Over Beethoven and Please Mr. Postman are all great versions, in my opinion, but, no, they don’t surpass or even equal the original versions. But that’s not the point–they are honing their craft, learning, experimenting and we’re having fun listening to them getting better all the time.